Grow Healthy Vending, LLC announces the appointment of three new members of its Advisory Board. Joining the Grow Healthy Advisory Board team are Amanda Katchka, Jim Chico and Sarah Kusch. We are very fortunate to have them as we continue to expand our footprint as the leader in healthy vending. (PRWEB) May 24, 2016 -- Grow Healthy Vending, LLC announces the appointment of three new members of its Advisory Board. Joining the Grow Healthy Advisory Board team are Amanda Katchka, Jim Chico and Sarah Kusch. “All three of them embody the mission of our organization and bring talent, expertise and energy to our team. We are very fortunate to have them as we continue to expand our footprint as the leader in healthy vending,” Christopher Wyland, Chief Executive Officer. Amanda Katchka is an Olympic Gold Medalist in the sport of Softball and also a color analyst for the Pac-12 Network and ESPN. She graduated from UCLA where she was a 3-Time NCAA All-American and part of the 1999 NCAA National Championship Team. Amanda resides in Huntington Beach, CA with her husband and two children. Sarah Kusch is one of the most dynamic and trusted celebrity trainers in the industry. She is dedicated to uplift, educate, and inspire through a holistic approach. She has a degree in Holistic Studies, with a minor in Acupressure and Ayurvedic Nutrition. She is a NASM certified trainer, with over 20 special certifications. She is determined to teach people how to live better in their bodies and transform form the inside out. Jim Chico is a 32 year vending industry professional and currently is the VP of Sales and Marketing for USI General Products Division. Wittern/U-Select-It has been a leader in full range vending machine solutions since 1931. He received a Bachelor of Science Mar/Com from Iowa State University. 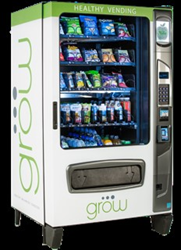 Grow Healthy Vending is a leader in the healthy vending industry and combines the highest quality equipment on the market with In House Location Procurement services. Grow's In House Locations Staff have successfully secured over 3500 machine locations across the United States and Canada in high foot traffic locations such as schools, universities, corporate offices, hospitals, YMCA’s and other pre-qualifed sites. If you are interested in becoming a Grow Healthy Vending location or operator, please visit http://www.growhealthyvending.com and bring fresh healthy vending solutions to locations near you.